Fishers, IN is a developing suburb on the northeast side of Indianapolis. Dubbed “the entrepreneurial city,” Fishers and its mayor have been focused on forwarding sustainable, long-term growth that attracts start-ups and new business in its downtown Nickel Plate District to keep the community vibrant and connected. Thus, the city decided to reduce their traditional advertising budget and focus on digital mediums, which were not only more cost effective, but also farther-reaching. Focusing on how they communicate with residents, the city significantly increased their social media efforts and digital mediums in general, including email, Facebook, Twitter, and Instagram. From there, they knew an app was the next step. Since launching their mobile app, Fishers has seen tremendous engagement from both residents and business owners. By using the app to promote various community events like their summer concert series, arts crawl, and shop local Saturday, Fishers has been able to drive participation and patronage to area businesses. Prior to and during these events, Fishers now sends push messages through the app to remind users of upcoming activities that they may have previously been unaware of. And with the in-app Message Center, users can even look at messages they may have missed, revisit past messages for additional information, or share with friends. The communications have resulted in a 25% increase in event attendance, unaided by traditional advertising methods due to their reduced budget in that area. With more than 700 downloads in the first launch month alone, the app has changed Fishers’ way of connecting with the community. When new businesses open up, Gasior encourages staff to walk in, show owners the app, and explain the engagement programs they have available through social media and other digital means. “Push notifications are the most helpful thing. Once it goes out, the message is still accessible,” said Gasior. With the addition of the Bluebridge Message Center, messages are automatically archived so app users have the ability to look back at push messages they may have missed. 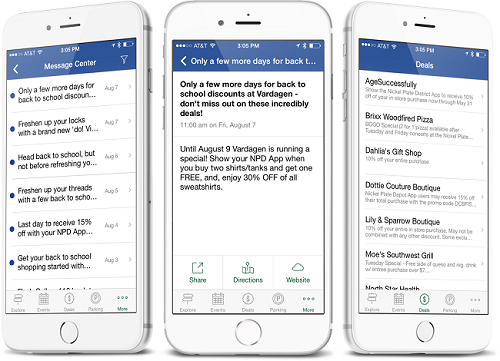 With actionable messages, Fishers can also drive users toward engagement by providing options to share the message, sign up for a particular event, or add it to their calendar. “Now with the Message Center, it’s really easy to push a short message, then go into detail once they open the message in the app,” said Casey Cawthon, Marketing and PR Manager for Fishers. “Government isn’t always perceived as warm and receptive. The app allows us to have a voice that’s engaging to the community,” said Gasior. Push notifications have been especially helpful with Fishers’ 2015 back to school campaign. By promoting specials that businesses were already offering and encouraging other shops to promote app-only deals, Fishers focused on generating buzz and business for local vendors. Now, local business owners have even begun touting the Fishers app in their own marketing. With a toolkit put together by the Fishers marketing and PR team, businesses now have graphics for social media, sample posts, and information about the app to appropriately promote their business. The toolkit materials and app give shops the resources they need to bring in business so owners can get back to selling. Fishers is always thinking of new ideas and ways to connect businesses with the community. Through the arts crawl event, 25 Fishers businesses were paired with 25 local artists. The campaign drove traffic to local shops before each concert night in their summer series by giving participants something to do before the event started. By providing an embedded map for users in the app, residents were able to participate and get the information they needed without having to plan ahead. Fishers has achieved tremendous engagement through the app and corresponding campaigns. The app has even captured the attention of Fishers Mayor Scott Fadness who has seen the results of the app and has been very pleased with the city’s ability to reach residents in creative ways. Going forward, Fishers plans on implementing even more digital and app-centric campaigns that creatively connect residents and business owners with their city government. “The app is the medium to help us get that done and accomplish that vision” said Gasior.